Bienvenidos was chartered in 1961 as the Woman’s Division of the Chamber of Commerce, and was renamed Bienvenidos in 1995. Since that time Bienvenidos has included and encouraged men to become members, and it is now known as the Volunteer Division of the Chamber of Commerce. The primary function of Bienvenidos is to serve the thousands of visitors from all over the world who come to Santa Fe. Our members operate the Plaza Tourist Information Booth from early May through the second week of October. Bienvenidos functions with generous support from the Chamber of Commerce, local banks and businesses. Monthly luncheon meetings with speakers are held from February through December, excluding July and August. The speakers, from various businesses and organizations in Santa Fe, provide valuable information, which our volunteers use while working in the Information Booth. Bienvenidos’ members are involved in many activities outside of the booth: some are docents in our many museums, others volunteer at the Audubon Preserve, the Wetlands Preserve, the Opera, and Las Golondrinas, to name a few. Walking tours of the Historic District are often led by our members. In addition we help at the Homeless Shelter and support the Food Depot. We serve the community by participating in major events including, but not limited to, Fiesta, the International Folk Art Market, Spanish Market, Indian Market and the Annual Legislative Reception. 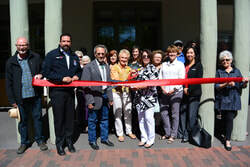 Bienvenidos has nearly 100 members and is truly one of Santa Fe’s premier volunteer organizations.